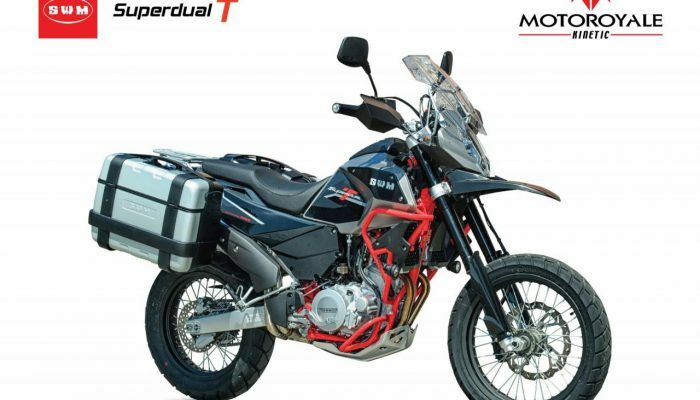 Motoroyale, the premium motorcycle division of the Kinetic Group, has announced a price reduction of INR 80,000 on the SWM Superdual T. This offer is valid for the first 250 customers or until March 31, 2019. The price of the bike has been revised and now stands at INR 6.50 lakh (ex-showroom) as compared to the previous price tag of INR 7.30 lakh. The Superdual 650 was launched in October last year. A part of the Italian marquee brand SWM, launched by Motoroyale in India, the Superdual T comes equipped with dual channel ABS, engine protection bars, LED auxiliary lamps, pannier mounting points, skid plate and 17 inch and 19-inch alloy wheels at the front and rear respectively. Also on offer are USD forks at the front with adjustable rebound at the front and a Mono Shock unit with preloaded and rebound damping adjustment at the rear. Powering the SWM Superdual T is a 600cc, single cylinder, a liquid cooled engine that is capable of producing a maximum power output of 54 hp at 7,500 rpm and 55 Nm of torque at 6,250 rpm. This engine is paired with a six-speed transmission.